Your washing machine is broken. What could be the cause? Fix your washing machine using our most common broken washing machine symptoms list. We will help you to determine why your washing machine is broken. 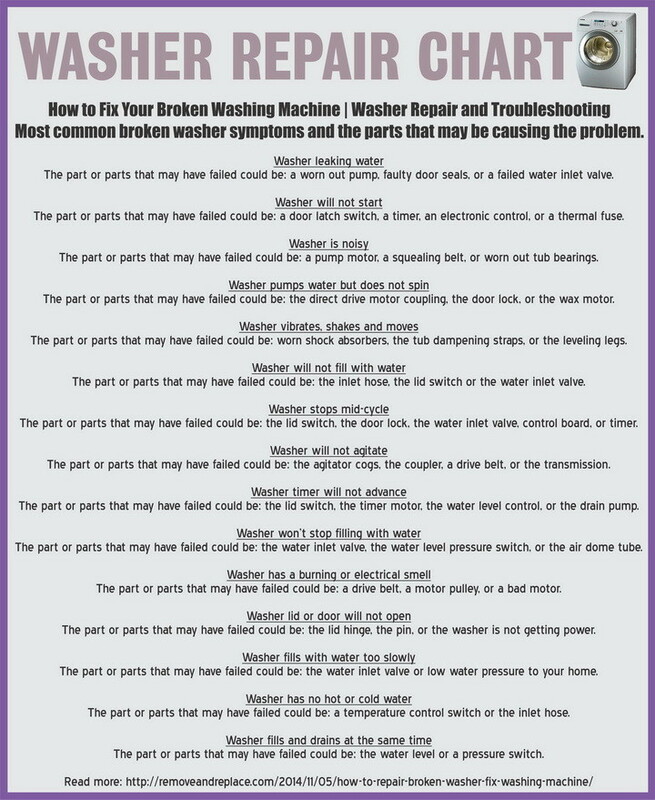 We will list the most common broken washing machine symptoms and the parts that may be causing the problem. Most common broken washer symptoms and the parts that may be causing the problem. The part or parts that may have failed could be: a worn out pump, faulty door seals, or a failed water inlet valve. The part or parts that may have failed could be: a door latch switch, a timer, an electronic control, or a thermal fuse. The part or parts that may have failed could be: a pump motor, a squealing belt, or worn out tub bearings. The part or parts that may have failed could be: the direct drive motor coupling, the door lock, or the wax motor. The part or parts that may have failed could be: worn shock absorbers, the tub dampening straps, or the leveling legs. The part or parts that may have failed could be: the inlet hose, the lid switch or the water inlet valve. The part or parts that may have failed could be: the lid switch, the door lock, the water inlet valve, control board, or timer. The part or parts that may have failed could be: the agitator cogs, the coupler, a drive belt, or the transmission. The part or parts that may have failed could be: the lid switch, the timer motor, the water level control, or the drain pump. The part or parts that may have failed could be: the water inlet valve, the water level pressure switch, or the air dome tube. The part or parts that may have failed could be: a drive belt, a motor pulley, or a bad motor. The part or parts that may have failed could be: the lid hinge, the pin, or the washer is not getting power. The part or parts that may have failed could be: the water inlet valve or low water pressure to your home. The part or parts that may have failed could be: a temperature control switch, valves on the wall aren’t open, or the inlet hose. The part or parts that may have failed could be: the water level or a pressure switch. We offer most all washing machine service repair manuals to assist you in fixing your washer quickly. LG error codes, Maytag error codes, Samsung error codes, and Whirlpool error codes. Samsung WF9854RWE, showing error 5E, drain pump is not working. Followed all instructions, cleaned and checked. Replaced the drain pump. New drain pump still not working. What are other possible causes? Amana washer, model LW4303W, shoots/ throws water out from bottom of basket on spin cycle. What is possible problem? Most likely you have a loose or disconnected water fill or drain line where the water is shooting out from when the tub spins. Open washer and inspect. I have LG washer model: WM3431HW/01. The power doesn’t get to heating element. Why would this happen and what part would I need to change? First, make sure the lint filter is clean and use a handheld vacuum to remove any excess lint that may be clogging behind the filter. Once you know the filter is clean and not blocking the unit from airflow, make sure you have the control settings correct. There should be a low and high heat dry setting, make sure it is on high. Test the washer dryer combo machine to see if that has fixed the issue. If not, then the thermal fuse is probably bad. You can access it and test it for continuity to be sure it is working. Also be sure that the wires that go from the thermostats, thermal fuse, and heating elements are not burned or frayed. Try the above and let us know if you need more assistance. I have just recently replaced the lid switch. Everything was going well until my S.O. washed several small rugs. It stopped after the agitation cycle. It will not pump out or spin. Have done the reset, (unplugging/plugging and opening and closing the lid as was suggested to someone else previously (yes i read other peoples E-Mail and responses… Now i’m going to remove the cabinet (again) and check the pump and clutch/brake??? not sure what else could be the problem… Any ideas? Overloading a washer can make the washer sense to much weight and therefore stop. Of course that depends on what type of washer you do have. Remove the panel and have a look inside the washer and HOPEFULLY it may be something as simple as a belt, pulley, or loose connection of some sort.